Our cannabis aroma paper in PLoS ONE has now been viewed over 4,000 times and downloaded more than 600 times since February. It’s gratifying to see so many people interested in a new research theme. And yet, because web-based metrics are automated, impersonal counters, I don’t have a clue who these people are. It hasn’t always been this way. 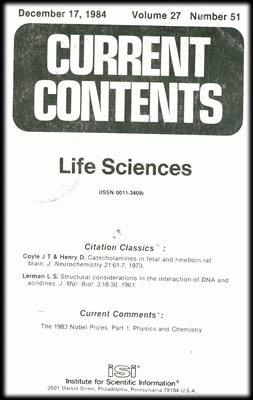 When I was in graduate school in the pre-internet age, the super-efficient way to scan the new scientific literature was to grab a physical copy of Current Contents, the weekly publication of the Institute for Scientific Information (ISI). It was a thick little booklet, printed on thin, bright white paper. At least it was bright white when it arrived in the mail and when your lab head got to leaf through it. By the time it reached the grad students’ offices, it was tattered, marked up, and usually stained with coffee, cheesesteak drippings, and rat urine. Current Contents listed the contents of the life sciences journals published that week, along with author names and addresses. This enabled you to request a physical reprint of the paper by mailing a letter or postcard. Better funded departments had pre-printed postcards for this purpose. 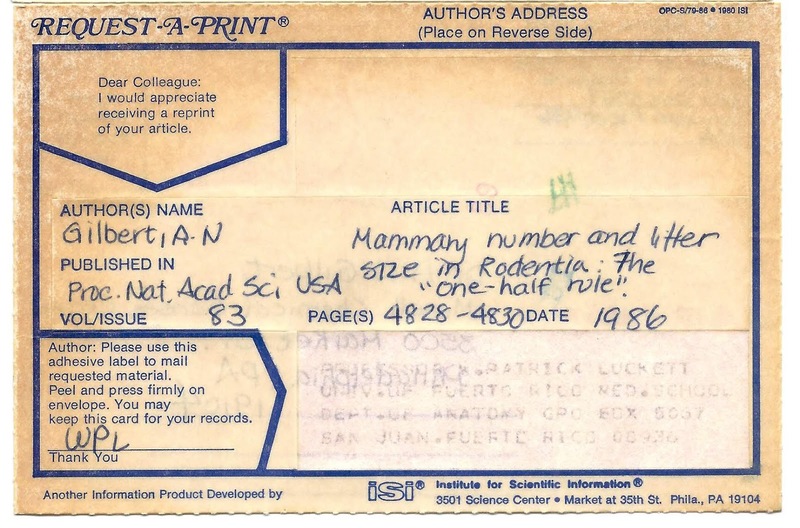 Really well-funded labs signed up for ISI’s pre-printed Request-A-Print® cards—they came with a peel-off return address sticker for the reprint sender’s convenience. 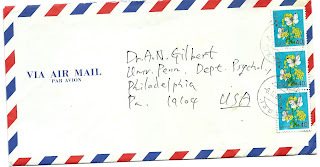 But you still had to fill in by hand the citation and the author’s address. 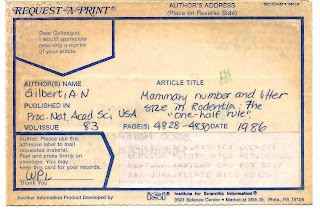 Although it beat going to the library and physically browsing recent, unbound issues of your favorite journals, this process was labor intensive. As a result, it made you think twice about the article in question: was it truly worth the effort of requesting your own personal copy? How many of us today download papers on a whim, only to have them stack up, unread, in our “worth a look” folder? On the flip side, receiving reprint requests in the mail was a rewarding experience, especially for a graduate student or newly minted faculty member. 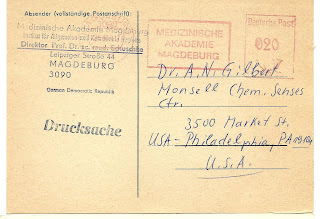 It meant someone had found your work sufficiently interesting to fill out the postcard. And you knew who they were! A reprint request from a Big Name in the Field was acknowledgment that you had arrived. 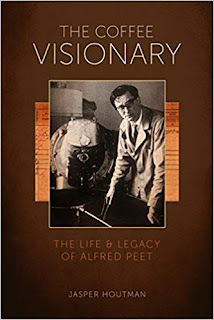 Reprint requests also brought a sense of connectedness with scientists around the world. 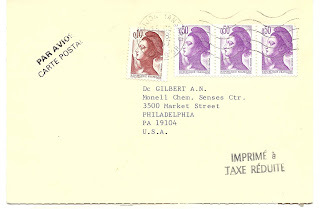 The mail would bring postcards with bright stamps and formal, cursive handwriting. The ones from communist block countries like East Germany, Poland, and Czechoslovakia were sad: printed on pulpy, low quality paper that oxidized in the sunlight and had a bitter smell. 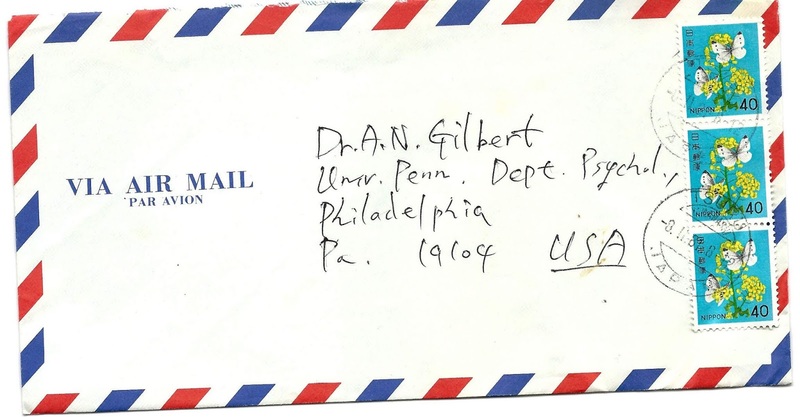 I always enjoyed fulfilling these requests—it meant acknowledging these scientists, keeping them connected to the free world, and encouraging freedom of inquiry. Given my current interest in the olfactory properties of cannabis, I monitor the relevant scientific literature and every so often scan the U.S. patent application database. 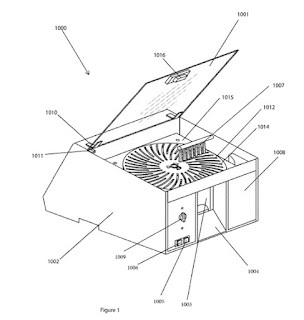 There are a ton of weed-related patents being filed. Some of the inventions are for practical devices, like this one for “Apparatus and related methods for trimming dried Cannabis flowers,” filed by Cullen Raichart of San Diego, California. Mr. Raichart aims to be the Eli Whitney of cannabis. The brief abstract and an illustration are all you need to understand his machine and what it does. Then there’s “Apparatus and methods for biosynthetic production of cannabinoids,” by Robert Winnicki, et al. This group of inventors is looking beyond the agricultural horizon and proposing to create THC and related cannabinoids in a bioreactor. Neato! As I browsed along, I found another application that sounded promising: “Method of producing cannabidiol derived products.” When I read the abstract I did a spit-take. Methods are provided for producing cannabidiol (CBD)-based products in accordance with cycles of the moon and a plurality of biodynamic rituals. 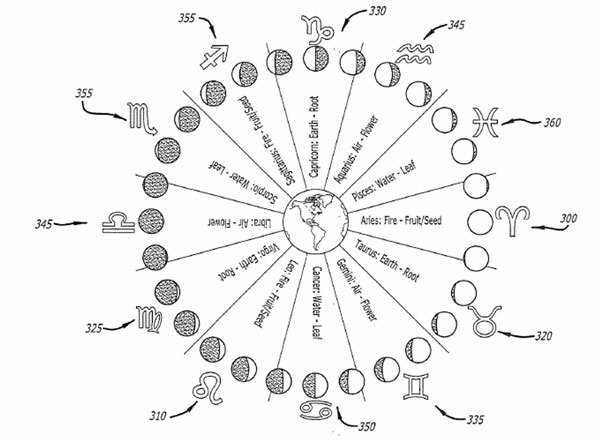 In some embodiments, the phase of the moon may be correlated with positions of the moon among the twelve zodiac signs, and the positions used to guide in the cultivation and harvest of cannabis plants. In some embodiments, the phase of the moon and the corresponding astrological phase that the moon is moving through may be used to determine when to plant seeds, when/how to water and fertilize, when to take cuttings, and the right time to harvest mature cannabis plants to produce optimal CBD-derived products. It is contemplated that farming cannabis with consideration of moon cycles may result in healthier plants, increased yields and superior products. Yes, you read that correctly! 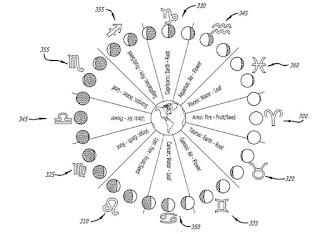 Inventor Christine Meeusen of Merced, California, seeks to patent a method of using lunar cycle phase and the moon’s zodiacal position to optimize timing of seed planting, watering, and harvesting of Cannabis. In one embodiment, the CBD derived products are only manufactured from the new moon to the full moon. On the first day of the cycle, a biodynamic ritual may be held under the stars so as to bless a work environment, such as a table. The ritual may include appreciation with respect to a Creator God and Mother Goddess. Depending on the product, a bundle of sage may be lit, and swept over any plurality of bottles and ingredients that include a high-proof alcohol to dissolve the bud. 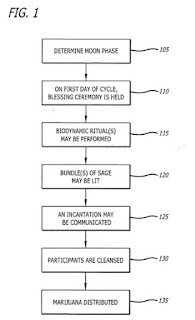 A plurality of incantations may also be communicated. 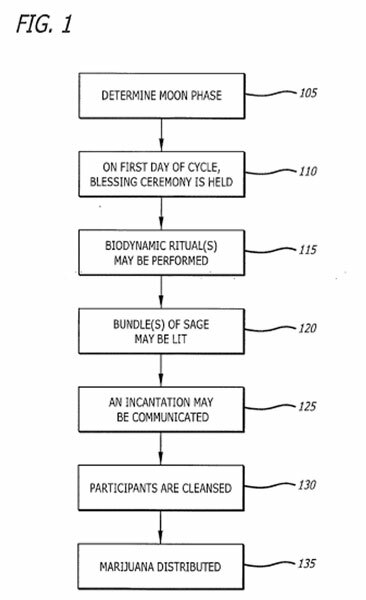 In one embodiment, the producers may utilize a bundle of sage so as to cleanse one another prior to production. In one embodiment, appropriate dosages of marijuana may be scooped into preparation jars. Is this a practical joke? Unlikely, given the expense of filing a patent. Is it performance art? Maybe. 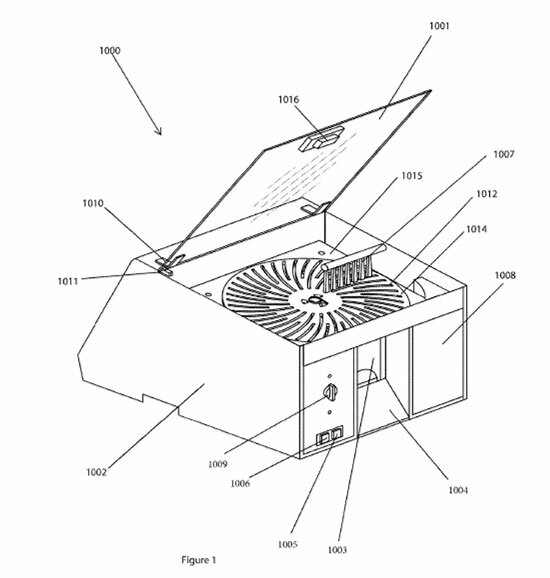 In any case, pity the poor patent examiner. The U.S. patent applications discussed here are 20180126578 (Raichart), 20180179564 (Winnicki et al.) and 20180169162 (Meeusen). A couple of weeks ago Lex Pelger, host of the Greener Grass podcast, dropped by my sensory lab in Fort Collins to tape an interview. His first questions were about my career in the science of smell and how smell works. Midway through (around the 16:45 mark) he turned to my latest research interest: creating quantitative aroma profile for cannabis strains. We discuss how this kind of sensory research can be put to use in the rapidly evolving cannabis industry. You can find the podcast here. Today, attorneys for plaintiffs Parlux Fragrances and Perfumania filed a blizzard of documents in their ongoing lawsuit against Jay Z. Why? Because at oral arguments on February 28, Jay Z’s side attempted to have key elements of the Parlux complaint tossed out, and Judge Ramos said no. That opened the way for Parlux to fire the big guns today. They asked the court to compel Jay Z and his company, S. Carter Enterprises, LLC, to produce a ton of documents and to answer interrogatories, i.e., a laundry list of questions regarding the dispute. And they want things to happen quickly—they asked for a hearing on their motion to be held on June 14. The attorneys are making liberal use of the protective order granted by Judge Ramos that allows them to redact sensitive information or file it under seal. Of the fifteen documents filed by Parlux today, six exhibits are under seal and two others are partially redacted. Still, FirstNerve can fill you in on the big picture. Parlux claims Jay Z was contractually obligated to be available to market, develop and promote the Gold Jay Z fragrance; yet he nevertheless failed to fulfill these obligations. Therefore, Parlux is demanding relevant information as to why; in particular, they want details about Jay Z’s schedule at the time and his obligations to other brands and business ventures. Parlux is also asking Jay Z’s side to put up or shut up regarding its counterclaim for damages owed to Jay Z; in other words, get real and tell us how you arrived at the dollar number you are demanding from Parlux. Although Plaintiffs duly paid the royalties which ultimately inured to the benefit of Jay-Z, Defendants simply refused to uphold their end of the bargain. As Defendants’ counsel acknowledged at oral argument in open court in February 2018, Jay-Z did not show up to a single personal appearance over the entire life of the license. The brief goes on to quote the same damning courtroom exchange that FirstNerve highlighted. The November 2013 events are not the only time Parlux sought the required input and involvement from Defendants only to be rebuked and/or ignored. In fact, numerous documents produced in this case demonstrate that this was the modus operandi of the Defendants for the entirety of the contractual relationship. 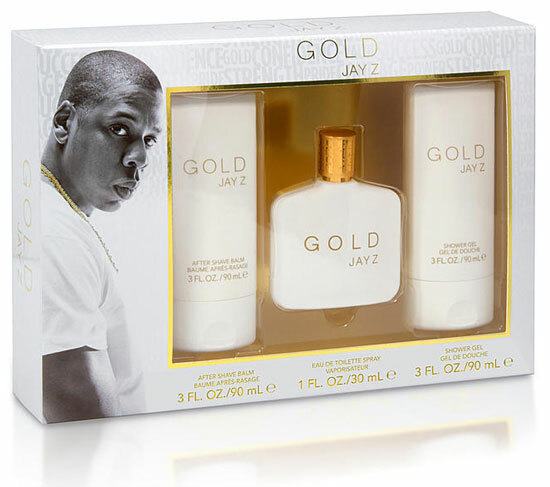 As early as April 30, 2013 – months before the scheduled launch of the initial fragrance – Defendant Jay-Z indicated his unwillingness to meet his contractual obligations. Apparently, taking the money and not doing the work is Jay-Z’s mantra. Included in today’s filings by Parlux are the interrogatories for Jay Z and S. Carter Enterprises (SCE) that were sent originally in May 2016. Interestingly, the questions extend to three other Jay Z enterprises: Artistic Brands Development LLC, Marcy Fragrance Trading Co. LLC, and Roc Nation Sports. 14. All documents concerning the location of the 18-carat gold GOLD JAY Z bottles designed by Jacob the Jeweler. 20. All documents concerning any effort that SCE or Carter undertook to promote, market and/or support any of the other brands and/or ventures that SCE or Carter own, or in which they otherwise have a financial interest. In the February hearing, Judge Ramos expressed puzzlement as to why this case it taking so long. If the Parlux brief is to be believed, it is because Jay Z’s attorneys are deliberately dragging their feet. Expect that to continue, but also expect Judge Ramos to turn up the heat and get the case moving.